There's growing concern over the serious decline in the African Penguin population, which experts say could be extinct within the next 10 years. Now several organizations along the Southern African Coast are building artificial nests for the birds, as a conservation tactic. The first two African Penguins arrived here at Boulders Beach, on the Atlantic Ocean, in 1982. They bred successfully the following year. And in 2005 there were nearly four thousand of them in this colony. But their numbers dropped dramatically in the past decade and at the moment there are around three thousand of them. "Historically there were about two million breeding pairs around our Southern African coastline. At the moment there's 19 to 21 000 breeding pairs remaining, Conservationist Justin Buchman said. "Which is round about one per cent of the population existing. That trend in its current decline could lead to the extinction of the African Penguin in the wild in the next 10 years if we don't put adequate conservation measures in place to arrest the decline. 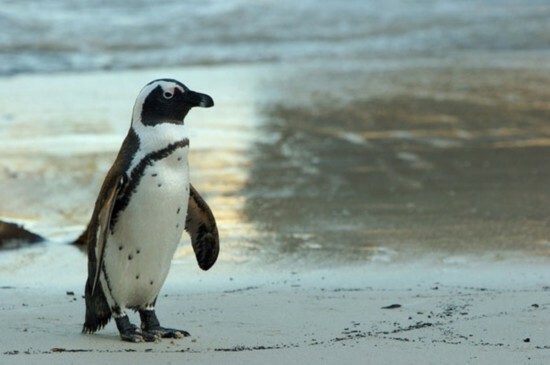 As an aspect of the eco-system these African Penguins play an incredibly important role. And as conservation managers we need to ensure their survival." "We take it very seriously that we have a species on our doorstep that is approaching extinction. So we'll do whatever it takes. We protect the birds at times when the environment gets extreme high heat or cold weather. Obviously we have marine accidents where the birds sometimes get covered in oil and they can die." Table Mountain National Park Manager Paddy Golding said. Major threats to African Penguins are marine oil pollution and a decrease in food supply from the ocean, such as pilchards, sardines and anchovies. And wildlife experts are so concerned about the dwindling numbers of this species, they are doing everything in their power to improve their breeding success rate. This includes providing the penguins with specially designed nesting boxes in which they can burrow, incubate their eggs and protect their chicks from predators and harsh environmental conditions. There's growing concern over the serious decline in the African Penguin population, which experts say could be extinct within the next 10 years.